She loves to work with cats and dogs. "It is constantly changing, different cases or injuries every day, so you never get bored." In her free time: "I enjoy helping elderly people with their pets. My husband and I like to go antiquing. I enjoy decorating also. Most of my free time is spent with our family and our pets." She enjoys working with all of the animals. "I enjoy each new challenge that every day brings. I love to see how happy pets make their owners, and I really love the people I work with." 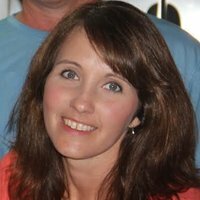 In her free time, she enjoys camping, drag racing, trap shooting, and spending time with family and friends. 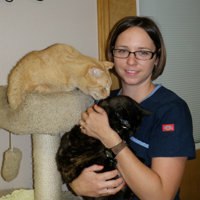 I started working at the Benewah Vet Clinic in 2008. Every day has been challenging, interesting, rewarding, a learning experience and a bit of excitement now and then. In the past I had a habit of taking all the misfit animals home but now I get to love all the patients without taking them into our chaotic household that already has a dog, 5 cats and 2 birds ! From the time I was a young girl, animals have had a special place in my heart. I grew up with many cats, a few dogs, a rabbit and a horse. My love for animals has grown over the years and now I have 2 horses, 2 cats and 2 dogs. My favorite animal would probably be horses, but cats & dogs run a tight second. Working at both veterinary clinics, Pinehurst and St. Maries, has given me opportunity to be with all kinds of animals every day, which makes each day very rewarding! As well as coworkers who enjoy their job as much as I do! In my spare time I like to ride horses, go boating, camp, ride 4 wheelers in the back country and garden. I have been working as a licensed technician since 1998. I have always enjoyed working with animals so being in this line of work just fit. There is always something new to learn and new challenges to meet. I am really enjoying the variety of animals at the St. Maries clinic. Over the years I have had a variety of my own animals and I can't see life without them. I currently have 2 dogs, 2 cats and 3 horses. I enjoy spending my free time with my family and critters along with working on my glass art. 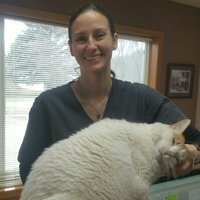 Dianne Chase is excited to have joined the Benewah Veterinary Clinic team as a Licensed Veterinary Technician in June of 2016. 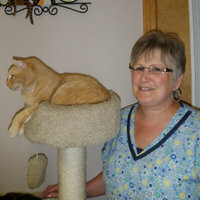 Her passion for working with and caring for all types of critters came from a very early introduction to animal rescue. Sometimes it seemed as if every stray or injured animal in Indiana lived at her house - at least for a little while! 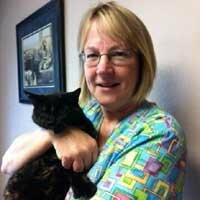 Dianne brings decades of experience in veterinary care - she cares very much about the state of your pet's teeth and their diet. She loves to explain what each medicine does and options on how to give it - successfully! Her favorite part of her job is providing critical nursing care to in-house patients. Dianne's life is blessed with her husband, Zane, four sons, one daughter-in-law, three dogs and one cat. She has always enjoyed working and recreating outdoors but wants to personally thank everyone involved in introducing her to the fun of group ATV rides in Northern Idaho! 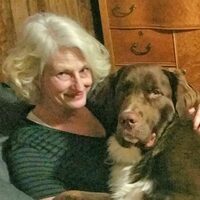 This is Dianne with Hank (Labrador/Malamute/Springer) on his first birthday (born 1/18/17). My first pet as a child was a special needs kitty. I had always been crazy about animals but, I knew then that my career would be working with animals. I began working as a veterinary technician in 1999, eventually becoming a licensed technician. My passion for working with animals is just as great now, as it was my first day. 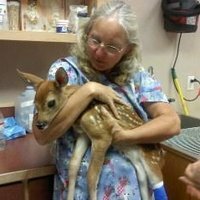 I really enjoy being part of a wonderful veterinary team, and helping sick or injured pets feel better. My family and I are very grateful to be part of the St. Maries community and we love spending time together outdoors, appreciating all this area has to offer. I enjoy spending my free time gardening, growing our own produce, and painting or crafting.